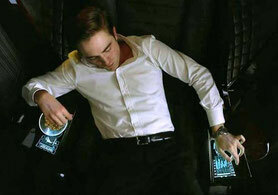 David Cronenberg’s Cosmopolis is a sterile mindbender, banking on long dialogue stretches of pseudo-psychology and technobabble to achieve some level of perceived intellectualism and statement on our troubled times. All it really achieves is a barely tolerable level of tedium. If heads explode Scanners-style while watching it, it would be out of overwhelming frustration and not astonishment. Slick young billionaire Eric (Robert Pattison) wants a haircut. The asset manager tasks his lead security guy Torval (Kevin Durand) with leading a trek across a clogged New York City as it prepares for a visit from the President of the United States. The journey is made all the more difficult due to vague, nebulous threats being made against Eric; and also due to the fact that it’s hard to maneuver a state-of-the-art, tricked out white limo through rolling street closures. The slow trip gives Eric plenty of time to conduct business and personal meetings with several people, including underling Shiner (Jay Baruchel), distant wife Elise (Sarah Gadon), his mistress (Juliette Binoche), and business colleagues (Emily Hampshire and Samantha Morton). He’s betting on the collapse of the Chinese currency, but his investment choices start to head south. Finances aren’t the only thing at stake as the threats made against Eric become more specific and potentially deadly. The limo, which on the interior resembles the bridge of the Starship Enterprise – complete with multiple graphic displays and even a captain’s chair, is like a rolling microcosm in which a seemingly normal day devolves into hardship and ruin. Business meetings start off banal enough, complicated by sudden dire news delivered in unnecessarily wordy monologues. If there’s a desire by Cronenberg to represent the complexities of seemingly simple theories of capitalism, it doesn’t really connect. As Eric’s psyche deteriorates, so does the world around him. Protests in the city turn violent, the limo dented and marred by spray paint. Activists make a point by hurling dead rats on a few occasions. Eric finds this mildly amusing when seated at lunch with his wife; he’s not laughing later when a showy anarchist pelts him in the face with a pie. Various interactions on the way to the representative haircut are all episodic and don’t create a synergistic inertia. The downfall of a venture capitalist is handled with straight-faced obligation, the drama never eliciting a meaningful reaction. Sure, it makes sense to represent an out-of-touch one-percenter as cold and unfeeling, but the routine wears thin quickly and the allegory of superficiality leading to serious, tangible consequences is stretched beyond its breaking point. Part of the problem is Pattinson, with a shaky American accent and cold smirk that never changes despite more of the salacious details. There’s no indication that Eric changes – he has the same expression when having a tryst or handling a firearm as he does when he becomes the hunted. Again, the dangers posed, and faced, by the buttoned-up, unfeeling modern businessman is part of the point, but it’s a shallow one. And certainly not one that needs to be reinforced time and time again. Heavy is the head that wears the crown, but that weight isn’t felt as the city decays around Eric. Working from the novel by Don DeLillo, Cronenberg’s robotic approach fails to effectively communicate the descent to insanity. To top everything off, check out the results of Eric’s haircut after he finally gets it – it’s terrible. The Cosmopolis Blu-ray includes audio commentary with David Cronenberg, a full-length documentary, and interviews with cast and crew.